Agencies involved in the search for three crew members, after an Irish Coast Guard helicopter crashed off Co Mayo, say weather conditions are severely hampering the operation. Poor visibility combined with a heavy swell at sea has stalled efforts to locate the aircraft's black box flight recorder. Organisers hope a critically timed operation between low tides on Sunday will lead them to the Sikorsky S92 and the bodies of three men who have not been found since the helicopter disappeared without warning early on Tuesday morning. The search has been narrowed to a 100 metre by 80 metre section of the ocean around Blackrock lighthouse, around 13km offshore from Blacksod, where the aircraft was intended to land to refuel moments before it vanished. The detection of a black box signal in that area has buoyed hopes that the bulk of the wreckage can be found along with the three remaining crew members. Declan Geoghegan, of the Irish Coast Guard, said the likelihood is that the black box recorder is still attached to the helicopter and it was also more likely than not that the missing crew members are still inside. "If you look at helicopter crashes, 92 or 93% of the time the bodies are found within the wreckage of the fuselage, it is so small," he said. "The other thing is that they are either strapped in or tethered - one or the other." Captain Dara Fitzpatrick, 45, the only one of the crew to be recovered so far, was found critically ill in the water on Tuesday and later confirmed dead. Her funeral will be held at Glencullen, Dublin tomorrow morning. The Irish Coast Guard says all efforts are focused on recovering the missing crew members: Captain Mark Duffy, Winch Operator Paul Ormsby and Winchman Ciarán Smith. It is hoped if Sunday's tightly-managed operation to try and locate the helicopter is successful, then a "bigger window" will be available on Monday during which divers or remotely operated underwater vehicles will be deployed to the wreckage. The Commissioner of Irish Lights ship, the Granuaile, which is equipped with a heavy lifting crane, is being loaded with equipment at Galway as it makes its way to the scene. 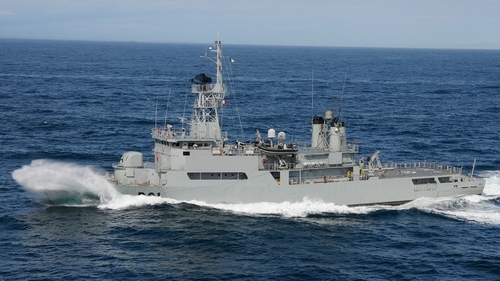 Two naval ships, Garda RIB boats and trawlers, with local fishermen who have expert knowledge of the waters, will be used to mount Sunday's operation. The underwater terrain, part of the lighthouse rock, and dangerous underwater currents in the area are adding to difficulties. The navy vessel LÉ Eithne is continuing to carry out a sea surface search this afternoon and local volunteers are combing the shoreline around Blacksod Bay. Naval service and garda divers are on standby to take part in the operation, as soon as conditions allow. Heavy rain has not deterred teams of people from taking part in the operation. Around 250 volunteers are involved and hot meals are being provided in the community centre close to Blacksod. Accommodation is being offered to those who have travelled to take part in the search. Significant sections of the helicopter were found close to Blackrock lighthouse yesterday evening. But air accident investigators say there is no evidence the aircraft struck the rock or the lighthouse. St Patrick's Day parades in Belmullet, Aughleam and Bangor-Erris were cancelled as a mark of respect to those who lost their lives in the crash. Meanwhile, Archbishop of Armagh and Primate of All Ireland Eamon Martin has paid tribute to the crew of Rescue 116 in his St Patrick's Day message and to the "bravery, commitment and dedication of the women and men of our own search and rescue services". Several hundred people have attended a candle-lit vigil for Captain Mark Duffy in his home village of Blackrock, Co Louth this evening. It was organised to allow people express their solidarity with the Mr Duffy's wife and two children, as well as his three colleagues who went down with Rescue 116. Fr Brian White said it was being held because "the village wants to show its support. There is so much emotion in the village and everybody wants to reach out and give their support to the family." Hundreds of people attended the vigil in the centre of the seaside village where Capt Duffy, his wife Hermione and their two children made their home. Mrs Duffy and the children attended the vigil for a short time in the company of members of the Irish Coast Guard.